Impressed with the German Gewehrgranatgerät design, the Japanese copied it with a few changes. The most obvious it the shorter tube. The pitch of the rifling appears to be slightly different (more spin). The base fuze design, however is almost an exact copy. as well as the aluminum grenade shaft. Method of attachment, and use are the same. I am not aware of any sighting system for this. 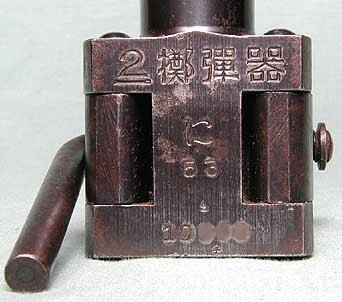 The stampings (2 Teki-Dan Ki) read "2 Grenade Implement".Translated: Type 2 Grenade Launcher." 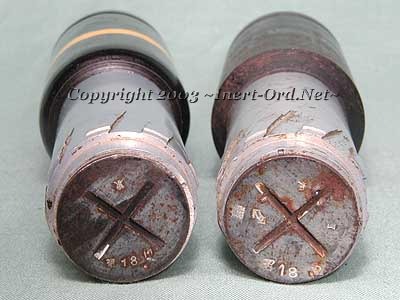 There doesn't appear to be any date, however the grenades are dated on the fuze plugs. The outward similarity to the Type 2 1/3kg cluster bomb might lead one to think the two warheads to be the same. It turns out this is not true. Close examnination of these two 40mm grenade bodies reveales that there are at least two variations that are not interchangeable. First off, the grenade has a different internal cone design, being much deeper that the air munition. If I understand shape charge physics, this would provide better armor penetration but less lateral blast effect (less explosive). This seems to make sense as the air dropped munition would probably be more effective having greater general explosive energy, as hitting tanks and vehicles was more a random event, and armor is thinner on the top, so less penetration is necessary. But greater general bast effect would be very useful. Second, while one grenade shares the same thread as the sub munition, the other is completely different. You can easily see the difference in the photo. Also note that the two grenades are almost the same date. If any one has some insight into these differences I would love to hear about it! Note that there is an ever so slight nose profile difference between the rifle grenades and the cluster bomb.